Need to Remove A Dental Implant? Dental implant complications, although rare, are generally related to poor planning, improper diagnosis, or inappropriate treatment option. Dr. H. Ryan Kazemi along with a team of skilled and knowledgeable restorative dentists offer solutions to various dental implant complications. The most common complications are inflammation or infection of the implant, bone or gum tissue loss, aesthetic issues, and functional problems. 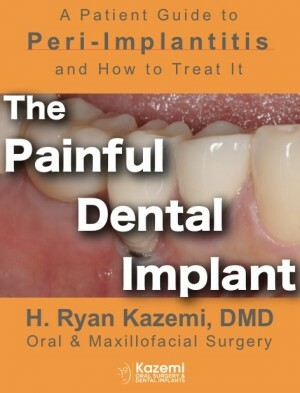 In Dr. Kazemi’s ebook, ‘The Painful Dental Implant’ he reviews such complications and how they can be best managed. Dental implants that are poorly positioned create a number of problems. These include difficulty making the restorations, cosmetic problems, hygiene problems, chewing issues, and longevity. To have long term success, dental implants must be positioned precisely with proper axis, depth, and angle determined by the restoration itself. Solution: If the implant is slightly off axis, then the restorative dentist can correct the angulation with a customized abutment and crown. If the implant is significantly off axis and simply difficult or impossible to restore, then the implant can be removed and replaced later once the site has healed. The implant can be removed a-traumatically and easily using special tools and techniques. The site of the implant might require minor grafting before replacement with a new dental implant. A loose dental implant is indicative of poor healing and non-integration into the bone. Under normal circumstances, the dental implant undergoes a healing process over three to six months during with it fuses with the bone (osseointegration). If the implant is loose, it means it has lost integration with the bone and is no longer in contact with it. This is referred to as a fibrous integration which means there is soft tissue between the implant and the bone. The implant may also be loose simply due to infection and bone loss. This is a failed dental implant. Solution: The implant must be removed as soon as possible. The site should be grafted if possible and prepared for replacement with a new dental implant once it has healed. ‘Watching’ a failing dental implant and hoping it tightens over time is simply unrealistic and does not work. 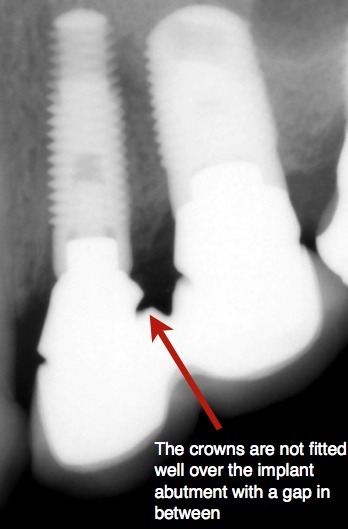 Once an implant has lost its stability and integration, it can not be fixed. It must be removed. Poor oral hygiene resulting in plaque / calculus formation. Solution: Once bone has been lost around a dental implant, it can not be repaired. Bone grafting is often unsuccessful in achieving coverage. The implant must be removed and the site grafted for replacement with a new dental implant at a later time. Any teeth with existing gum disease next to a dental implant should be treated to optimize the health of the surrounding tissues. Solution: Mild and acute inflammation may respond well to a professional cleaning and better home care. However, persistent inflammation or infection requires surgical intervention. If there is an infection, antibiotics may help temporarily. Bone grafting and tissue grafting are unpredictable and may be effective in rare cases. With persistent inflammation or infection the best option is to remove the implant, restore the missing bone and replace with a new dental implant. Dental implants are made of commercially pure titanium or titanium alloy and are generally quite strong. However, they can fracture if placed under excessive load. Dental implant fractures occur mainly from excessive amounts of lateral force. This can be a result of an implant restoration that has not been properly equilibrated or one with significant cantilever and off-axis forces. Dental implants may also fracture if the diameter of the implant is too small for the its supporting restoration. 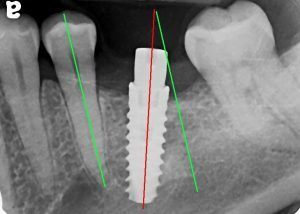 For example, a 4-mm diameter implant for a molar may have higher risk of either implant or abutment-screw fracture due to excessive cantilever forces on the restoration. The primary cause of dental implant fracture is a loose crown or abutment and continued biting and chewing. 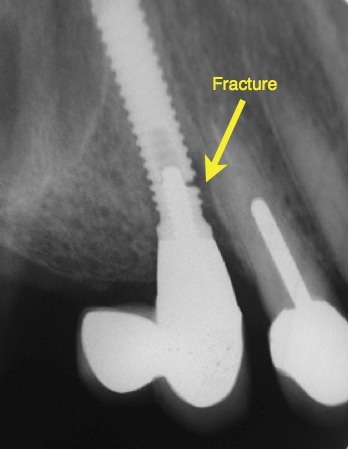 The forces of chewing can result in fracture of the holding screws or the implant itself. Any loose crowns or components should be checked immediately by your dentist and tightened to prevent damage to its foundation. Solution: If the screw holding the crown / abutment to the implant is fractured, it might be possible to remove it and replace with a new screw. If the implant itself is fractured, then the implant must be removed, grafted if necessary, and replaced with a new dental implant at a later time. Bone graft is required when there is insufficient bone to support dental implants. The specific technique and materials for bone augmentation is based on the area of the mouth, the type of bone defect, and the treatment plan. Bone graft failure can occur either during the healing phase or lost later due to excessive resorption. Solution: If the bone graft is still in place but compromised, it should be evaluated by an oral surgeon. Depending on its state, it might require some supportive therapy and observation or complete removal and debridement. If the graft is removed, the site should be allowed to heal for 2-3 months before another grafting procedure is done. Infection can compromise the health and success of the bone graft. It can be caused by poor surgical techniques or poor home care. The key is prevention by first using proper techniques and materials and also by following strict post operative instructions. Solution: If the infection is mild, it might respond to antibiotic therapy. If it is more severe, the bone graft will probably require removal along with antibiotic therapy. Once the sites heal, a second grafting may be done. Bone graft healing can be compromised if the overlying gum tissue recedes or breaks down. Once the bone graft is exposed, it loses blood supply and hence compromised. Solution: If the exposure is small, it might respond well to supportive therapy such as rinsing, antibiotics, and soft diet. The gum tissue might gradually regenerate and cover the exposed part. If the exposure is more significant, the supportive therapy may be complemented with conservative smoothing of the bone graft at the exposed site. In some circumstances, if the exposure is very severe and the graft appears to be mobile or infected, then it must be removed. The site can heal for 2-3 months and then a second grafting may be attempted. Solution: Once an implant is restored, the dentist should obtain confirmation X-ray to make sure all components are precisely fitting. The position of the crown and its relationship to other teeth and the bite should also be checked. If there are any discrepancies, then the restorative dentist may order the laboratory to remake the crown or take a new impression. When it comes to dental implants and restorations, ‘close enough’ is not adequate. Solution: See your restorative dentist immediately for examination. 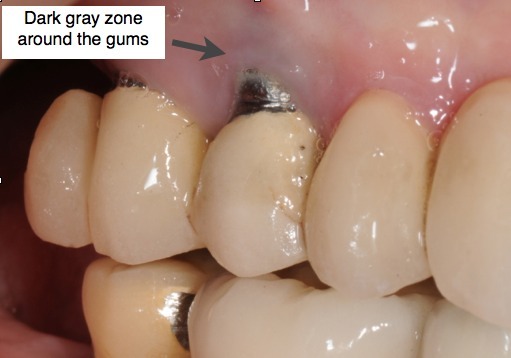 The dentist must first see what the reason for the loose crown is and then address the source of the problem. If it is a loose abutment, then it needs to be tightened with an appropriate torque wrench. If the screw is loose, then it can be tightened or replaced with a new one. Cement washout should not happen if there is good seal all the way around the crown margin. If the crown does not fit precisely over the abutment, then it must be remade. If the bite is the source of the loosening, then a careful evaluation of bite and occlusal adjustments can correct the problem and prevent it from happening again. Implant size too small- The width of the implant is too small in relation to the size of the space of the missing tooth. 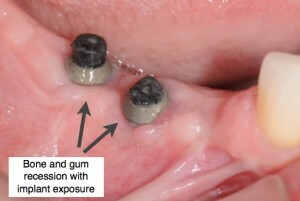 Poorly positioned implant– The implant is not centered in the space and positioned too close to adjacent teeth or tilted. Use of stock abutments- These are factory prefabricated components with ‘one-size fits all’ characteristics. Poorly fitting crowns- This is the actual tooth part that sits on the implant. Poor fit can happen from low quality fabrication process or inaccurate impression process. Crowns with poor shape and open contacts- Crowns with improper contours and contact easily entrap food and make cleaning difficult. The right solution depends on the cause of the food entrapment. If the implant is too small for the space, your dentist may be able to correct the problem with a customized abutment and a properly formed crown. If this is not effective, the implant may have to be removed and replaced with one that has a correct platform size. Using special instrumentation and techniques, a dental implant can be easily removed and replaced with a new one. Poorly positioned implants are extremely difficult to restore and they often result in poor cosmetic results and difficult access for cleaning. For implants with a slight degree of misalignment, your dentist may be able to create a customized abutment and crown to correct the problem. However, if the implant is significantly misaligned, removal and replacement with a new implant may be the only viable option. Use of stock abutments is a very common cause of food entrapment. The abutment is the component that sits on the implant and supports the overlying crown. Abutments are important in developing the transition from the implant to the crown and directly affect the support of the surrounding gum tissue. Some dentists use stock abutments that are factory made and only come in certain sizes, and often fail to develop the proper transition required for aesthetics and gum tissue support. This is why we advocate the use of customized abutments in every patient. Customized abutments are made to fit the space precisely and support the gum tissue properly. They also set the foundation for the overlying crown. The crown is the actual tooth that is supported by the abutment, which in-turn is secured to the implant. The crown must fit precisely and sit properly on the abutment. Any gap between the crown and the abutment can result in plaque retention, food entrapment, and gingivitis. The crown must also be made with proper contours and shape, contacting the adjacent teeth just right. Even with properly positioned and sized implants and customized abutments, a poorly shaped crown can result in food entrapment and poor cosmetic results. The oral surgeon must select the right implant size that is appropriate for the site of the missing tooth. This is accomplished through proper diagnostic models, cone beam CT scan to assess the availability of bone, and clear communication with the restoring dentist. The oral surgeon must place the implant in the precise position using a surgical guide. Again, this is achieved through proper diagnostics and collaboration with the restoring dentist before the implant is placed. The restoring dentist must use customized abutments. This is the only way to create the natural contours for the correct transition from the implant to the crown. While customized abutments cost more, the results are remarkable. The crown must be fabricated such that it fits precisely over the abutment and has the proper contour and size supporting the surrounding gum tissue. This requires that the restoring dentist provide the laboratory with detailed instructions. Furthermore, the laboratory must use high quality materials and great workmanship provided by skilled technicians and master ceramists. Replacement of missing teeth with dental implants requires an investment of your time and hard-earned money. The treatment must be carefully planned by your dental team and delivered correctly the first time so you will enjoy headache-free results for years to come. Solution: If the darkness is due to mild recession, then a gum graft may help although the results are unpredictable. If the darkness is due to the metal abutment, then your dentist can change it to a ceramic (Zirconia) abutment and a full ceramic crown. The color of the crown must match the adjacent teeth for a natural and beautiful smile. Color mis-match is very unaesthetic as the crown looks fake and without life. This can be caused by poor color selection by your dentist or poor laboratory fabrication process. Solution: The only solution is to remake the crown. Your dentist should first evaluate the color of your other teeth under regular or special office lighting. Then a detailed prescription must be written to the laboratory technician or master ceramist who will make the crown. This prescription can be accompanied with photos and models to help the technician in the process. Sometimes, the lab ceramist may actually come to the office and see the patient along with the dentist. This way they can better collaborate on the best color and design. The dentist should work with a very good quality laboratory who will take the time to create not just a tooth, but an art. Gum recession results in very poor cosmetic results. Gum recession can be caused by gum disease, bone loss, or poorly positioned implant. Solution: Gum grafting may be helpful but is relatively unpredictable. 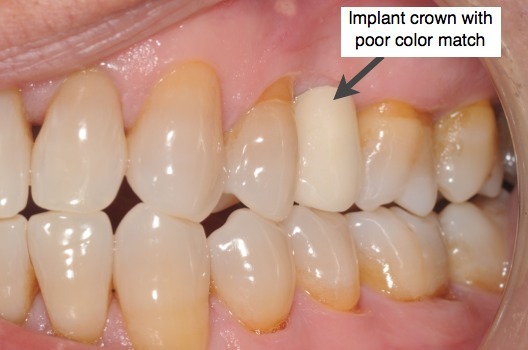 The restorative dentist may decide to make the crown with pink porcelain to camouflage the receded gum. Results are not perfect, but can be acceptable. 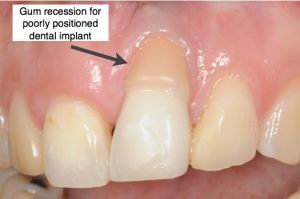 If the recession is due to bone loss, then considerations should be given to removal of the implant, rebuilding of the bone, and replacement with a new implant. If the recession is caused by a poorly positioned dental implant, then it should be removed and replaced at a later time. Bone and gum tissue grafting may be necessary before a new implant is placed. The cosmetic result of any implant crown depends not only on the right color and position, but also on the right size and contours. 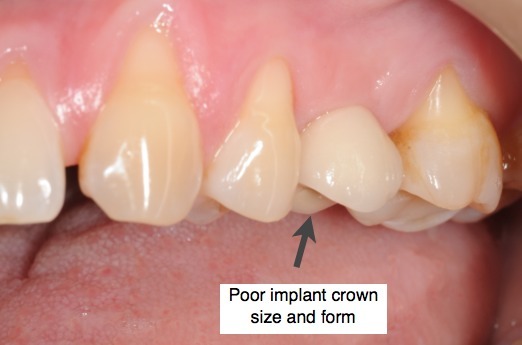 A crown that is too big or small or poorly contoured for the space can be unaesthetic. Solution: Before the entire treatment, the surgeon and the restorative dentist should collaborate and share all diagnostic information to design an effective treatment plan. Photos, X-rays, cone beam ct scan, and models are necessary for proper diagnosis and planning. The dentist may order a wax-up prototype of the crowns even before the implants are placed to see how they might look and fit into the space. Customized abutments should be used all the time and avoid use of prefabricated abutments. The crown must be carefully fabricated by the laboratory with proper size, form, and fit. It is with consideration of all these factors that one can expect teeth that look and feel natural. Solution:Your restorative dentist should perform a thorough occlusal (bite) analysis. This involves evaluation of how the teeth relate together and move during function. Minor adjustments can often resolve the problem. If the crown or the components are not fitting well, then they should be remade. The size and form of the teeth should also be checked to make sure they are in harmony with the other teeth. Occasionally, patients complain of jaw or muscle pain following restoration of their implants. This often due to bite problems or a crown that is not fitting aligned with other teeth. When patient bites down, interferences happen which can lead to trauma and hence painful tooth, muscles, or jaws. Solution: Have your dentist evaluate the bite and the relationship of the implant restorations. Minor adjustments can resolve the symptoms in a few days. Cheek following restoration of dental implants can be caused by either inappropriate crown / prosthesis form and contour or by bite discrepancies. Solution: Have your dentist evaluate the bite and the shape of the crowns. Minor adjustments may alleviate the problem. Solution: Make sure you are practicing effective oral hygiene by flossing and brushing as instructed. If the problem is poorly contoured abutment or crown, then it should be replaced with a new customized abutment and crown. All components should be precisely fitting each other with no gaps or spaces. Numbness after an implant procedure is the result of nerve disturbance / irritation during the placement procedure. It can also be caused during administration of local anesthesia if the needle touches the main nerve branch (this type is temporary and usually resolves in 6-8 weeks). The degree of nerve disturbance from implant placement and how long the numbness will last depends on the type of nerve injury. If mild and very superficial, it usually resolves in 6-8 weeks. If moderate, then partial or almost complete return of sensation may happen up to 9 months. If severe injury, then it may be long term or permanent numbness. Solution: You should ask the surgeon who performed the procedure about any unusual findings during surgery, the length of the implant used, and their opinion. If there is concern of implant impingement on the nerve, a cone beam CT can be done to assess the position of the implant and either remove it or back it out to eliminate pressure on nerve. Otherwise the only option is to allow time for healing and possible improvements. The sensory function should be tested periodically to assess its progress. We offer a unique and non-invasive technique for removal of failed dental implants.The procedure can take as little as 10 minutes with minimal patient discomfort.With special instrumentation and technique, the implant removed by simply rotating it out of the bone. It does not require any removal or cutting of the surrounding bone which helps to preserve the bone for implant replacement.